I would like to thank the amazing Mari Nosal for adding articles to our site. As seen in the article it is funny sometimes how a simple object or statement or situation can really change the dynamics of an environment. It shows how something basic can be a great tool for education and other people. The school age children had the day off from school. I worked a nine-hour day. My kindergarten charges joined me for the day as the kindergarten room follows the public school schedule. It was a test of my patience and energy as the curriculum was non academic for the day. I had forgotten Friday was a school holiday. I perused my curriculum and realized I would need to restructure it to keep the children engaged. I had thirty minutes before I was due to leave for work. I searched around my house for supplies I could bring in for added activities. I resigned myself to the fact that I would leave early and grab supplies from the local convenience store. As I prepared to leave, I spied a huge pumpkin on my deck. My family used it for mere decoration I rationalized. My kids are young adults, they wouldn’t miss it. I grabbed the pumpkin and threw it in my car. Several activities could be had from this one pumpkin. I ran back in the house and found shaving cream. Another Aha moment, shaving cream puffy paint would be enjoyed by everyone. Sometimes I amaze myself at how quickly I can develop a project out of desperation and common household products. Flexibility is a major component in being a successful teacher. Successful adaptation to any situation ensures a lack of chaos in the classroom. I dropped the pumpkin in my class and scurried down the hall to retrieve my charges that had been dropped off at an earlier time. We sat and broached the day’s activities as a team, killing time until the rest of the class came in. thirty minutes later we had a full house. We went to circle time and I pulled out a book that was on my curriculum. As soon as the children saw it they begged for me to read a book from a series we had used the past week. I took a vote. The Magic School Bus Scours the Ocean Floor Was retired in lieu of a book about children who couldn’t find their shoes and designed footwear out of the likes of meatloaf and bologna! It was a vacation day for the kids so I decided to let them have a part in the curriculum and go light on them. 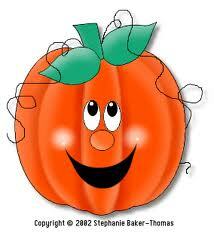 After reading the book we observed and talked about the pumpkin. The children were enamored by the pumpkin carving kit I brought in. It was safe for children and I believe in a format that allows for independent exploration. In order to teach team work the children were broken into teams and I instructed them to draw four different faces that they would carve. I injected humor by stating that with four different faces we could turn the pumpkin around when we got bored with one face. After drawing their mark, we headed outside with the pumpkin and started carving. The children were extremely excited with the experience of using carving tools. After carving was done we proceeded to dig out the guts. Some children were apprehensive about sticking their hands in the guts so I offered gloves. They dug out and placed the flesh in one pan. The seeds were placed in another. At this point the children were ready for free time and the pumpkin was temporarily laid to rest. Some children wanted to ask questions about the seeds and flesh. A mini science class ensued for the children who wished to continue our pumpkin adventure. I held the tiny seed next to the pumpkin for comparison. I explained how the pumpkin we cut open grew from a seed just like the one we held in our hand. This went on for thirty minutes or so. I was shocked at the interest. After lunch, I took the class on a field trip to the kitchen. We rinsed the seeds and flesh. The children remarked on the slimy feeling. I explained how the texture would change upon baking the treat. Cinnamon was sprinkled on our treat. We than baked these items. At snack time I presented the items for exploration to the children. The pumpkin seeds were popular. I assume the children had eaten them in the past. The pumpkin flesh was viewed with a degree of trepidation. I inquired as to who liked pumpkin pie. The majority of the children did. When I explained that what they were looking at was the main ingredient in the pie they looked at me with confusion. I believe in exploration of the unknown, so I pushed the issue. I asked my little pessimistic friends to take one small taste. If it was not palatable they were welcome to spit it out. Most children were pleasantly surprised. A simple pumpkin had afforded the children a new experience. Be the first to comment on "Memoirs From Halloween – A Pumpkin Became A Classroom Learning Tool by Mari Nosal, Guest Writer Extra-ordinaire"